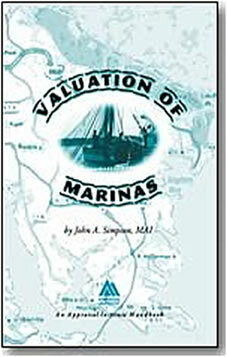 There are places where appraisal theory breaks down in its application to appraising marinas. By a large margin, finding comparable rentals for marina restaurants and repair facilities is the most egregious. Appraisers are supposed to find comparable rentals to determine the market rental rate. This also comes in handy when the subject is leased and the lease rate is above or below market. If it’s above, there’s additional “value”. When below, it’s the reverse. This is what peers expect and what bankers expect. The users of appraisals couldn’t give one iota whether an appraiser does this or not. When you have an office building or a shopping center, the number of potential properties from which to draw a subset of rentals is gigantic. Many times you don’t even have to go outside of the town to get data. There are just a lot of them to choose from and real estate people cooperate with appraisers for the most part. But when it comes to marina comparable rentals, it all breaks down. Marinas are special purpose properties so there are a fraction the number of those compared to typical commercial properties (where the expectation for data was derived from). 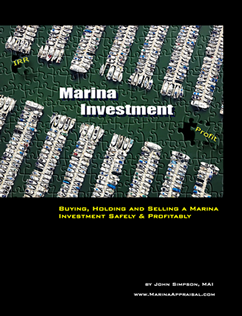 There are hardly any marina brokers and they don’t have much information. You can pretty much round that down to zero, it’s that close. So the potential pool of data is very small and the number of cooperative real estate sources is even smaller. That’s not encouraging. There aren’t many marinas that have restaurants or repair facilities. Some are just plain slip rentals, some are purely dry stack, some are mainly hotel, inn, or motels with slips as incidental, and some aren’t even marinas at all (e.g. the resort selling slips to homeowners, all of which are for private resident use, not the general public). Take out yacht clubs from the equation. Same goes for the golf course/resort marinas that have private gated access. Perhaps the occasional commercial fishery or pier needs to be subtracted from certain locales. I could probably go on, but you get the point. How many times can you slice the pie to see the piece is really small? Most restaurants and repair facilities are not leased. There’s are some very good reasons for this. First, an owner of a marina wants to maintain control. So they own it and run it. They do not lease it to a restaurateur or repair operator. Instead, they hire the restaurateur or on a salary and let them run the business, collecting the income instead of letting a tenant get it (the bar sales are the real profit generator here). If the restaurant is simply a tiki bar or one that serves only continental fare like hamburgers, hot dogs, and other items that don’t require daily deliveries or spoil quickly, which is the norm for marina restaurants, it’s easy to just have a manager and not a restaurateur. Quite simply, in either case there isn’t a rental there to get! Another reason why they aren’t renting it is because the rental income is so low compared to the gross and net income the business generates that it makes no sense to do so. The gap for repair facilities is much greater than for a restaurant, but the relationship holds well for either. Third, if the owner made the property available for sale, you can bet it was purchased by the restaurateur or repair operator so they could maintain control and not be put out with nowhere else to go. When you go to marina restaurants or repair facilities and ask to speak to the manager, you often do not get people who know the lease rate to provide to you. If it’s a leased facility, which as you can see above is rare, that lease might be dated. I recently completed an appraisal where the restaurant tenant had been there for 15 years. The rent just kept slowly creeping up. They viewed the rent as reasonable not from the viewpoint of what the real estate should rent for (it’s market rent) but in relation to the income their business generates. Sometimes lease rates are based on a percentage of gross. Just try and ask a marina restaurateur or repair operator what his business grossed last year and what the percentage amount paid for rent was. And then be glad he doesn’t have security around! To a business owner, that’s the cardinal sin. It’s the equivalent of asking you what your salary was last year. Even if they know the lease rate, they won’t give it to you! It’s pretty simple. You don’t have a need to know. You can plead or even beg – it will avail you nothing. It’s confidential and proprietary information. The only real question is whether they will be civil to you or treat you rudely for asking. It’s coin-flip odds. If by some strange quirk of fate you get the rental rate, you know nothing about it. Is it a gross lease, a modified gross lease, or a net rate with the tenant paying all expenses? If the size of the facility isn’t available on tax record, you can bet you won’t be permitted to measure the building(s), so there’s a built-in fudge factor to visual approximation that really weakens the rent per square foot you’re trying to obtain. Forget getting a copy of the lease or a lease summary sheet. That’s like asking a homeowner for a copy of their mortgage. It’s not going to happen. No real estate professional has this data. Not even the brokers who sell them! They get the financial statements and don’t ask for the leases. Why should they? The lease income is already built into the financial statement. It’s just detail. I don’t blame them. The expectation that appraisers would be more successful that marina brokers is an absurdity. As you can see, the number of obstacles to getting marina restaurant and repair facility rentals is great. It’s a formidable challenge. How successful am I and my team? Sadly, even with decades of experience doing this, there is no magic button we can press and get the data, let alone enough to make a comparison. It’s rare we get even one, let alone three or more. It’s gotten so that we advise our clients in our engagement letters that it is extremely likely we will be unsuccessful in obtaining that data. Oh, we try, but remember – the client typically does not care. It’s just appraisal theory to them. So the expectation is that we won’t come up with rentals for marina restaurants or repair facilities. But that doesn’t mean there isn’t value to those components! Fortunately, we have two fallbacks: the income and expense statement and the subject lease. When you think about it, that’s exactly what a typical market participant would use anyway if they wanted to come up with a purchase price. They wouldn’t do any fancy market search for leases – they know that would be a waste of time and a crazy pursuit. So, yes, we can still consider these components from a market perspective. But not totally from the lofty world of appraisal theory. Hey, that’s a good thing!